Christmas Oratorio, BWV 248, Pt. 1: Cantata for the First Day of Christmas, No. 1 Chorus "Jauchzet, frohlocket, auf, preiset die Tage"
Christmas Oratorio, BWV 248, Pt. 3: Cantata for the Third Day of Christmas, No. 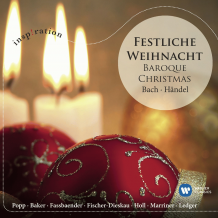 13 Chorus da capo "Herrscher des Himmels"
Christmas Oratorio, BWV 248, Pt. 5: Cantata for the First Sunday in the New Year, No. 1 Chorus "Ehre sei dir, Gott, gesungen"